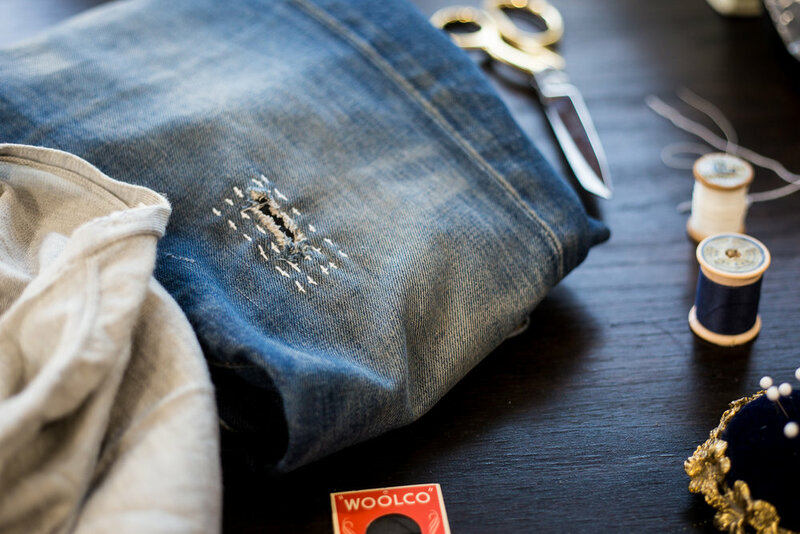 I mend my clothes because I believe that all the best objects come with a story. I believe that things worth owning should be worth keeping and worth repairing. I believe that we do not need landfills of fast fashion and that the clothes I wear should not have harmed anyone on their way to my closet. About five or six years ago I learned about the human and environmental impacts of fast fashion. As a result, I shifted my buying habits and began to put the skills I had learned during a summer spent working at a historical textile repair firm and time spent sewing for a large history museum to work in my own closet. The result was mending, both visible and invisible. Kintsugi is the traditional Japanese method of repairing broken pottery with lacquer and precious metal. The art form hinges on the idea that something that has been broken can be put together and become more valuable because it has been broken and then mended. I began learning Kintsugi in 2016 after breaking something important to me. I could not bear to throw it away and I began to research methods of repair. I stumbled upon the method of Kintsugi soon after and though I might give it a try. I ordered the materials and have been slowly honing the craft ever since. Kintsugi is a slow process - mending something this way can take weeks or months due to the curing time of the lacquer but the results are always beautiful and have brought many precious things back into everyday use. I practice visible mending as every-day art but I love to share it with others. I teach textile mending classes several times a year and take the occasional commissioned repair of broken ceramics and run a wait list of interested individuals. Finally, one of my long term goals is to partner with a ceramics artist to produce a run of kintsugi mended pieces. To inquire about the possibility of having your piece mended or to get in touch with me about a collaborative run of kintsugi with me please reach out to me via email.